Geoff Hollow’s work, not seen in London since a small memorial show in 1999, is still fresh, vibrant and relevant. It is apparent that in his own meticulous way, Hollow was as involved as any of his contemporaries with the business of moving painting forward from Abstract Expressionism. With his dogged approach and serious ambition, he energetically pursued his “experiment” of making art, building on what was established and expected from a received abstract tradition, and yet creating substantially new relationships within his work. This show of his paintings from the Eighties and Nineties is an opportunity to look afresh and acknowledge that Hollow was, in his own cool and consummate way, a strong communicator of the ‘currency’ of painting: colour, spatial form, structure and architecture. Much recent abstract painting is signposted by a form of group identity, subject perhaps to a certain over-familiarity. 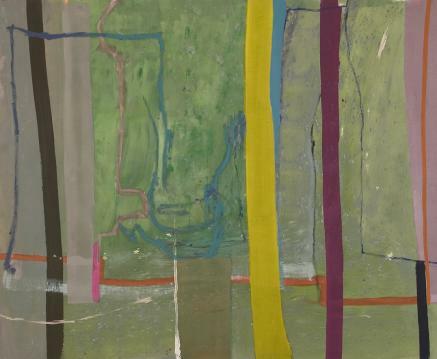 It is as if it yields to the near certainty that it is not going to improve on the work of Hofmann, Noland, Poons and Heron – painters whose works form the canon from which Seventies and Eighties abstraction was launched. Hollow was always a full participant in the community of abstract artists working in Stockwell Depot and Greenwich studios. Nevertheless, through selectiveness and thorough self-examination, he managed to create a strong and individual identity for his work. In Hollow’s best paintings the combination of direct colour and significant form slowly emerges, conveying a sense of subtle yet forceful control. He painted with a rather distinctive ‘soft’ geometry, a clever combination of lightness of touch and weight of intent. His ability to build, to work the painting out on the canvas, without allowing the result to become overblown, is impressive. Hollow's process seems to question how far you can push one colour and subdue another without creating overly dramatic planar space caused by the colour ‘jumping’ at you. The visual evidence of these processes on the surface of the canvas means that the paintings hold your focus. Hollow makes clever use of his intuitive ideas. In Sound of the Strings 1991 there are grounds, broken up areas, stripes, intense colour and washes. The integrated spectrum of colour creates sophisticated overlapping spaces, without recourse to an over-lavish tonal quality. The painting contains wholly unexpected but clearly constructed ‘moves’ which seemingly present such risks to the modulation of the colour areas, and yet are convincing in their assimilation within the overall structure. A red line meanders across the picture, affecting and energizing everything that it crosses but not compromising any other element. The unencumbered vertical yellow stripe is a frighteningly bold move within the picture which could dominate and divide but instead settles and integrates. Hollow's method of building a painting does not succumb to the use of planes, stripes and patches of colour simply in order to create ‘push and pull’. There is a confluence of tension, space and time that is created through manipulation of direct colour design, culminating in a convincing three-dimensionality. The organization of the painting presents a seemingly hazardous, skewing approach to the rectangle, demonstrating a strong impulse to create and develop original pictorial motifs, but Hollow never seems to abandon, for the sake of an idea or narrative, the core language that is essential to painting. By following his eyes and his intuitions, he arrives at paintings that are always compulsively visual. Hollow’s work sets a strong example of the potential achievements of the abstract picture. He balances the freedom of expression that abstract painting is capable of when pushed to the limit with the need to “pin the thing down” and deliver a coherent result. Hollow's paintings represent a considerable accomplishment, both within the context of the Eighties and Nineties when they were produced, and in relation to the development of abstraction since. Poussin Gallery would like to thank Kay Saunders for her help and enthusiasm in putting together this exhibition.